Those familiar Lord’s Prayer phrases at issue: Does God lead us into temptation? The memorized “Lord’s Prayer” is so frequently recited by countless Christians that it can be easy to slide past what the familiar words are saying. For instance, how do we understand its most puzzling phrase: “Lead us not into temptation, but deliver us from evil” (Matthew 6:13 per the King James Version and many other English translations. A condensed wording for the prayer also appears in Luke 11:2-4). So, does God lead us into temptation? Why would He? After all, the New Testament tells us elsewhere, “Let no man say when he is tempted, I am tempted of God: for God cannot be tempted with evil, neither tempteth he any man” (James 1:13, also King James wording). Some scholars adopt that end-times interpretation, but there are other choices. Experts also disagree on whether believers ask delivery from abstract “evil” or from a personal “evil one,” namely the Devil. Here The Religion Guy will bypass that one. “Keep us from being tempted” (Contemporary English Version). “Do not cause us to be tempted” (New Century Version. “Don’t allow us to be tempted” (God’s Word). “Do not bring us to hard testing” (Good News Translation). “Keep us clear of temptation” (J.B. Phillips paraphrase). “Keep us safe from ourselves” (The Message paraphrase). “Keep us from sinning when we are tempted” (New International Reader’s Version). “Don’t let us yield to temptation” (New Living Translation). “Rescue us every time we face tribulation” (The Passion Translation). Roughly similar, but those different shadings are the sort of thing that keeps theologians up nights. Esolen noted that Jesus himself prayed to be spared from the cross, just as we pray that God will spare us from the tests we all know are inevitable in life. IMAGE: Word cloud care of the Internet Monk. 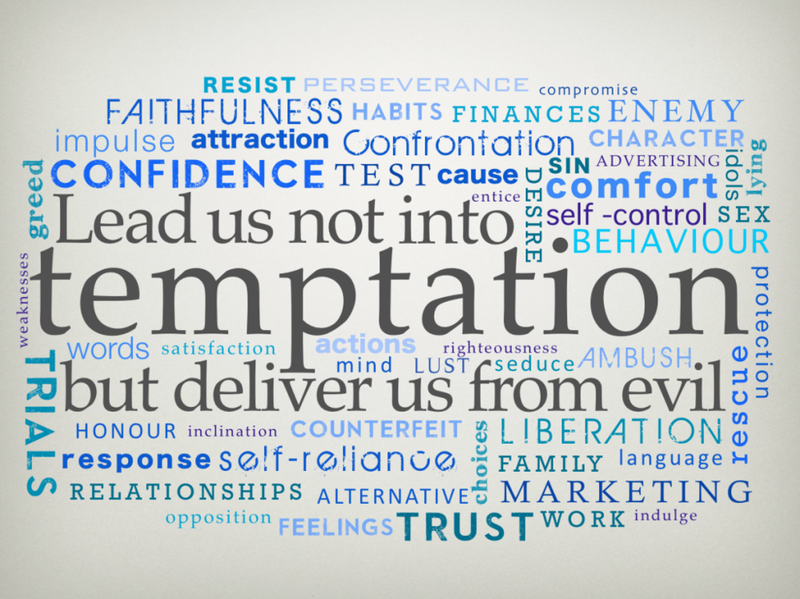 Continue reading "The Lord’s Prayer at issue: Does God lead us into temptation? ", by Richard Ostling. Newer PostWhat five religion-news stories truly impressed you in 2017? It's time to praise them!